These cork boards are easy to use and make changing your cork displays around a breeze! 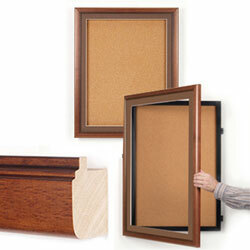 We supply these cork boards with the hardware essential for wall mounting to effect installation even easier! Our cork boards, dissimilar to other cork bulletin boards, incorporate a special gravity lock and swinging frame, which renders for rapid display changes. You can even open these corkboards with merely one hand! To open the community bulletin board, merely slide your hand up the back of the frame to free the gravity lock. The swinging frame can open up a full 90º, leaving your bulletin board location open to effect essential changes without any hassle. 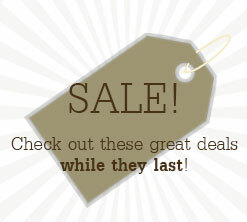 With an 30" x 36" tacking surface, you'll have plenty of room to post all of these critical information. 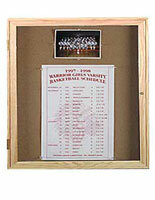 Once you've finished making your bulletin board display changes, merely hold up the lock until the frame closes. Your cork boards are once again secure. The contemporary wooden frame of these community bulletin board displays, which is complemented by a decorative mat board trim, adds a sophisticated touch to any interior setting. 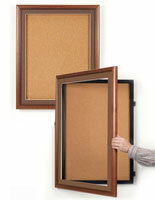 The beveled mat board stays attached to the bulletin board's frame, leaving your cork posting location free for changes. 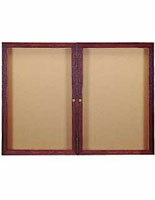 We extend these enclosed cork boards in 4 other finish options moreover the Walnut finish seen here. 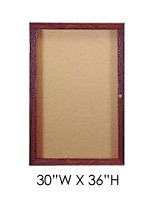 With this many finish options, there is bound to be one to comprehensive your office interior. 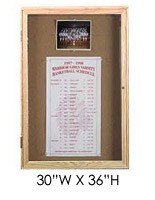 Cork boards, especially these enclosed information boards, will display your announcements and media content in style while keeping them secure and secure. These cork boards are engineered for high-traffic setting., so they're ideal for car dealerships, museums, hotel lobbies or even retail stores. 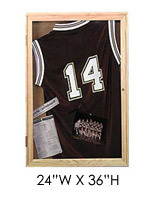 Sheltered by a shatter-resistant acrylic window, you can leave your worries of meddling and unwanted damage in the dust! Known as a result, your cork bulletin boards can be seen and not touched. 33.5" x 39.5" x 2.3"